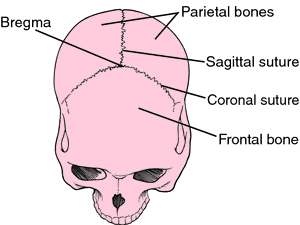 the point on the surface of the skull at the junction of the coronal and sagittal sutures. adj., adj bregmat´ic. 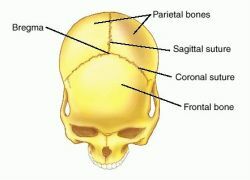 The point on the skull corresponding to the junction of the coronal and sagittal sutures. The junction of the sagittal and coronal sutures at the top of the skull. the junction of the coronal and sagittal sutures on the top of the skull. bregmatic, adj. The junction of the coronal and sagittal sutures in the skull. 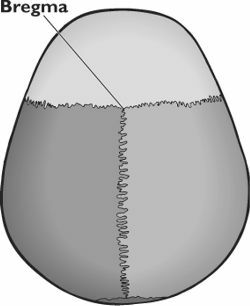 The point on the top of the skull at which the irregular junction lines of the bone (the coronal and sagittal sutures) meet. Also known as sinciput. n meeting place on the skull of the anterior sagittal and coronal sutures. Point on the cranium corresponding to the junction of coronal and sagittal sutures. n the point at which the sagittal and coronary sutures meet. 2 b bregma intersection of the sagittal and coronal sutures 2. 0 mm anterior and posterior to the bregma and the block was embedded in paraffin. 80 mm from the bregma point were stained with cresyl violet acetate stain, and hippocampal area measurement was performed using imaging software. 5 mm posterior to the bregma and processed for preparing paraffin sections according to routine protocols. Afterwards, brain specimens were cut at 35 [micro]m using a vibratome (Leica, Microsystems) starting from rostral Bregma, -1. 22) The sterotaxic coordinate with respect to the bregma were -0. 32) Table II: Description of sutural bones studied Sutural bone Description Bregmatic Ossicle A bone present at the junction (BO)/Ossicle at of the Sagittal suture with the Bregma (OB) Coronal one Coronal Ossicle A bone present in the Coronal (CO) suture. The distance in mm of the regions, from anterior to posterior, corresponded to Bregma levels 3. A 24 ratas Wistar machos de peso corporal comprendido entre 250 g y 280 g, bajo anestesia con Pentobarbital (10 mg/Kg) y Ketalar (25mg/Kg), se les implanto estereotaxicamente, en el lado izquierdo del cerebro una canula guia de 10 mm hecha de tubo de acero inoxidable de 21 gauge, de acuerdo a las siguientes coordenadas para la ACC: 0,5 mm lateral a la sutura sagital; 2,7 mm anterior al bregma y 4,5 mm ventral a la superficie craneal (38). No se identificaron en la muestra huesos suturales en la sutura coronaria, asi como tampoco en bregma y en pterion. 2 mm posterior to bregma to count the number of activated macrophages/ microglia (CD68+ cells), MHC-II+ cells, pathological oligodendrocytes (Tau-1+ cells), Nogo-A+ cells, and astrocytes (GFAP+ cells) per field.